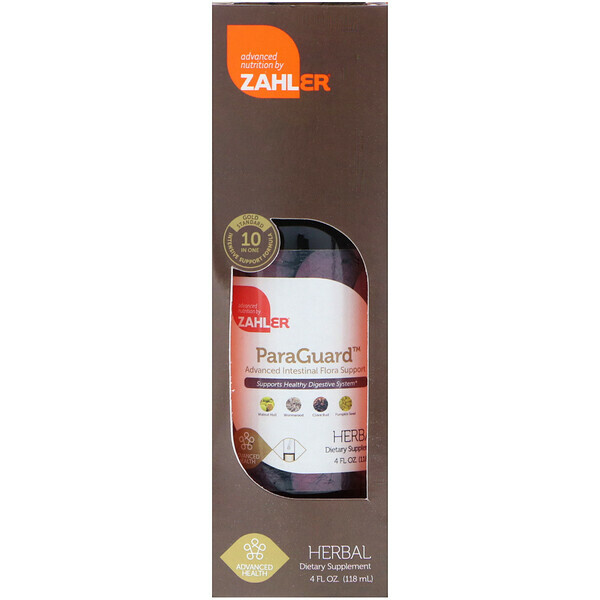 Zahler ParaGuard contains a unique, intensive blend of 10 herbs and essential oils that have traditionally been used to support and restore vitality to digestion and microbial balance. Mild Support: 15 drops 2x daily for 10 days. Intensive Support: 30 drops 2x daily for 30 days. Mild Support: 20 drops 3x daily for 10 days. Intensive Support: 30 drops 3x daily for 30 days. Mild Support: 30 drops 3x daily for 10 days. Intensive Support: 30 drops 4x daily for 30 days. Vegetarian glycerin, water, natural flavor. Keep out of reach of children. Do not use if safety seal is damaged or missing. 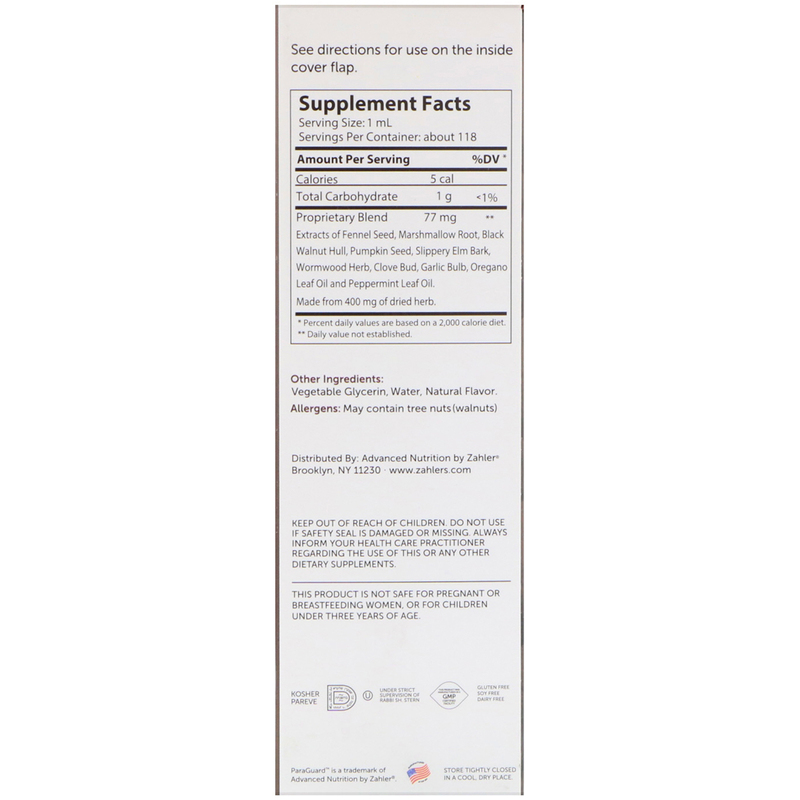 Always inform your health care practitioner regarding the use of this or any other dietary supplements. This product is not safe for pregnant or breastfeeding women and for children under three years of age. 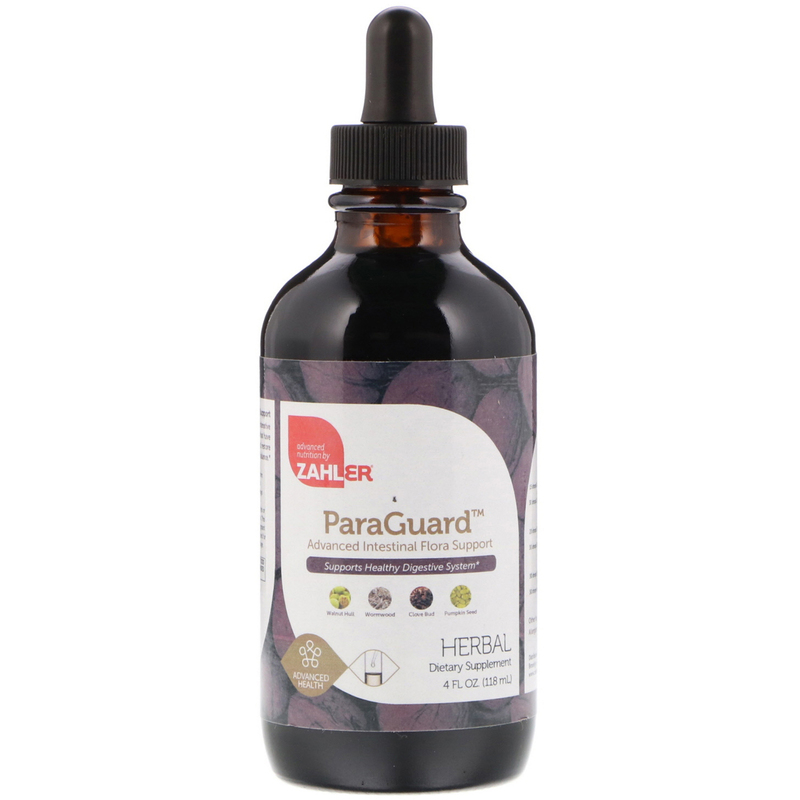 Some mild increase in digestive discomfort can be expected with initial use. If you develop more acute symptoms, or serious abdominal pain while using this product, consult a healthcare professional. Extracts of Fennel Seed, Marshmallow Root, Black Walnut Hull, Pumpkin Seed, Slippery Elm Bark, Wormwood Herb, Clove Bud, Garlic Bulb, Oregano Leaf Oil and Peppermint Leaf Oil.